Unused, as I am to blogging I am entirely happy to ‘give it a go’, in order to share with others the fabulous opportunity which I have been given in light of the bursary from a-n The Artist Information Company. 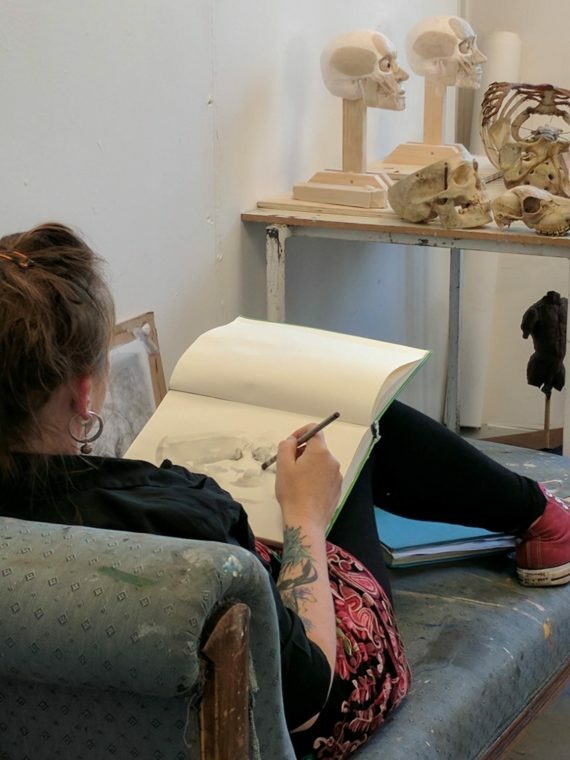 My professional development bursary has enabled me to attend an incredible 7-day course in the Ruskin school of Art, Oxford; covering anatomy, drawing and more. 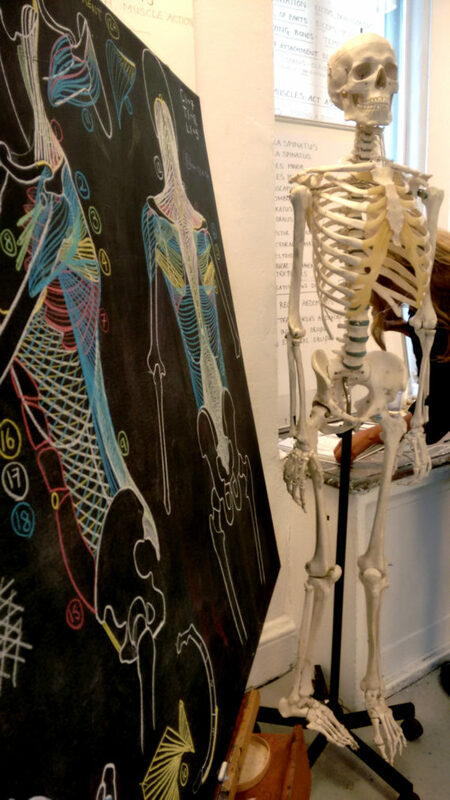 This Art and Anatomy short course is led by the delightful Dr Sarah Simblet, anatomist, artist and author, alongside Eleanor Crook, sculptor and medical artist. On day one we were introduced to structural drawing, working from ‘Granddad’ the skeleton; we became comfortable with drawing the skeletal form. We also benefitted from a presentation of contextual studies placing anatomical studies into context from its beginnings to its current usage. It is a delight to be able to work alongside international students who are making the most of the highly qualified staff and great facilities of the Ruskin school of art. For my part it has already been a fascinating journey referencing technical drawings skills long since neglected. It is incredible how much information comes flooding back when we sit and engage as students rather than as the teachers we can become so used to being. I am also delighted to be able to promote the concept of bursaries. Without funding, this is not a course I would have been able to access, meaning that myself and in turn my students would not have the benefit of what I will learn. The final day, and what a day it was. 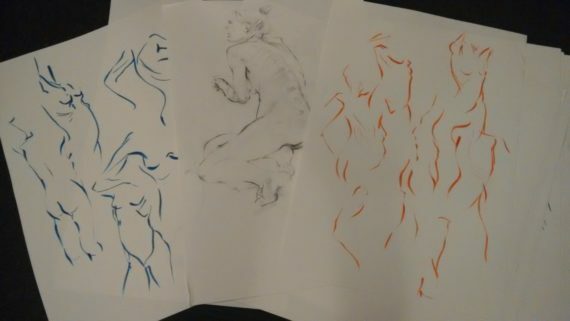 The whole day saw us submerged in life drawing. Patti our model was divine to draw, an artist’s dream. Her slender form revealed muscle, sinew, tendon and bone. As she danced to the selection of music that she had brought with her, we were able to catch her in motion as her stretched and flexed, revealing her incredible form. The modest speed at which she turned allowed us the opportunity to make marks on the paper to reflect her gentile swaying which so magically revealed her delicate form. I became utterly entranced and lost myself in the beauty of her mesmeric movement and the fine balance of her form. It was an impressive performance, which we were privileged to witness. In the afternoon we worked with more traditional life drawing poses. We had several thirty to forty minute poses, where we could produce a range of drawings in a variety of mediums. I was able to pick up some great tips from Dr Sarah Simblet on how to further develop my own work as well as some great ideas for further engaging my life-drawing students in future classes. I will never forget the opportunity of working with Patti the dancer, such an incredible model. The entire course was entirely unforgettable. The course content, the tutors, the location and the rest of the group were all fabulous. It has been a very busy week full to the brim of education, information, new skills and companionship. I will continue to benefit from the opportunity to attend this course for some time. I cannot be more grateful to A-N information for the bursary, which enabled me to access this opportunity. So today was day six of the ‘Art and Anatomy’ course. Today was a combination day, studio time, continued anatomy learning, drawing and a visit to the Raphael exhibtion in the Ashmoleon Museum, Oxford. Today I began to evaluate all the work, learning and thoughts that have filled my mind for the past week. The Raphael exhibtion was a good place to start this. Examining the detailed work of a master with new eyes was an amazing way to evaluate how my new understanding of anatomy feeds into my appreciation of the accomplishments of other artists. I may not yet remember the names of all the beautifully rendered muscles within the Raphael collection but I do know now what I am looking at and it really does add another dimension to the work. I’m now able to see this work within a contextual setting and to appreciate the aesthetics, skilled observations and sensitive renderings of the 15th century Italian master. As I make my way around the exhibtion with my new companion I am able to raise my understanding and appreciation of this work to a new level. Back in the classroom I begin to contemplate all that I have learned, so much fascinating technical information that I feel I’m overflowing. Psalm delivers a brief talk with an invaluable research sheet to accompany our continuing research and the learning continues. After some further in-depth anatomy learning with Dr Sarah Simblett, I settle on the chaise longue to draw some human and animal skulls. 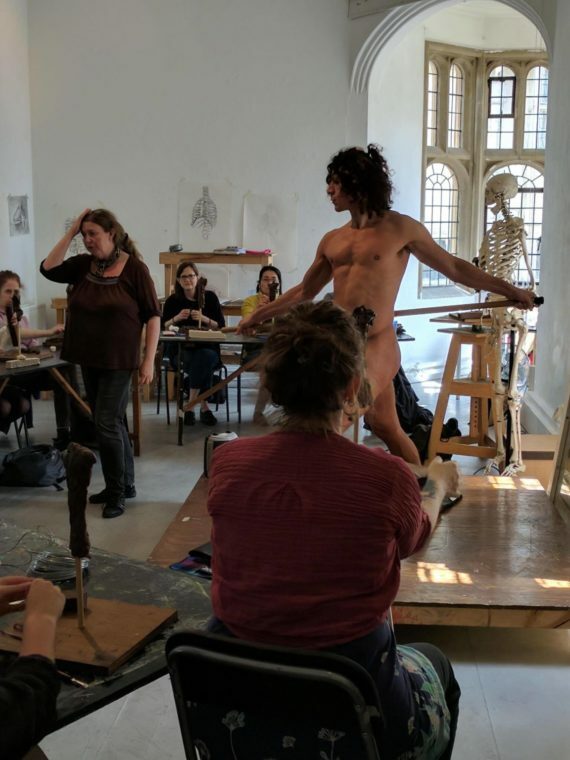 As what else would you want to do on a Friday afternoon in the Ruskin school of art on one of their art and anatomy courses? Day four and a move on to sculpture, wax and the teachings of Eleanor Crook. Eleanor has great knowledge in the field of anatomical and medical waxes. A specialist in this area she has worked for various universities, museums and medical foundations constructing scientific, historical, educational and artistic wax models. 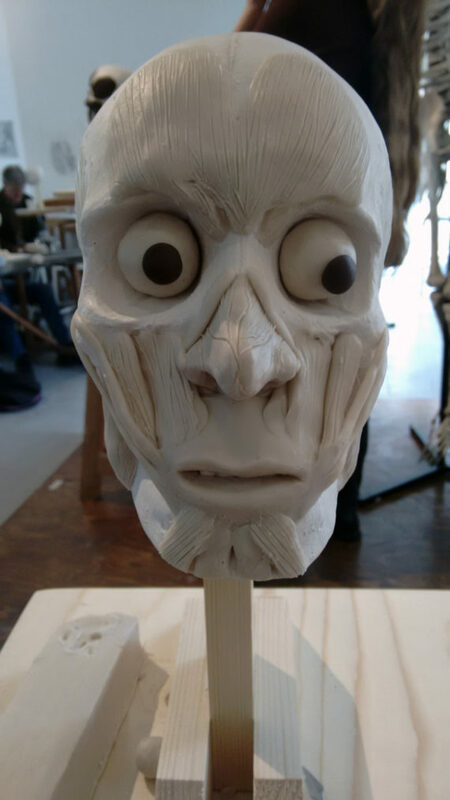 Today was spent learning about modelling wax and the muscles of the face. One by one we applied areas of (wax) muscles to plaster skulls, whilst Eleanor explained and demonstrated (much to our delight) the facial expressions that would be produced by each muscular action. Grimaces and grins accompanied the extensive learning today as well as sneers, frowns and pouts. This thorough overview of the facial structure, normally hidden by human skin was deeply informative, and as with preceding days on this course dealt with the topic of anatomy so much better than could have been done via a textbook. My understanding of the look and function of muscles including the overall depth of facial soft tissues will be invaluable to my future understanding and handling of both 3D and 2D materials when used to describe the face. Eleanor’s approach to teaching is deeply engaging. Her ability to make the process come alive was fascinating. As well as the contextual background, Eleanor shared with us work she has been engaged with, past and present. This helped link the historic and scientific implications of the skills she uses, with the artistic talents she brings in to play when working around Europe, exploring old wax collections and adding to culminated knowledge of wax, it’s inherent modelling properties and its continued medical, historical and artistic value. Day three and wow does my brain ache. I will really sleep well tonight. I am astonished at how much information the mind can retain. Dr Sarah Simblet yet again astounds with her incredible knowledge within her field of study. We had a whole day of fast track learning about the anatomical system, layering drawings to illustrate the functions of the muscles and ligaments. Apart from learning about anatomy, today I also learned about teaching. The Ruskin students have been lucky to have been taught by Sarah for many years. She has vast experience of relating information to a variety of audiences. What comes across most apparently, apart from her vast knowledge, is her ease in sharing this information. She is so enthusiastic that you can’t help but want to know more. I sincerely hope that I can in some way inspire in my own students this passion for knowledge and learning that Dr Simblet imparts in these sessions. And so what did I learn? Well lots! So much in fact that my brain will be continuing to process this information for some time to come. What will stay with me however, from moment one, is my appreciation that our bones are actually alive, how they change throughout out lives and tell us, long after death, stories of our strengths, our ailments, and our endeavours. Anatomy is about life. It is the story of humans caught up in these vessels that we sail our lives in. Like beautifully complex time capsules our bodies carry us forward and live on far beyond the time in which our conscious sparks expire.